Web Services Enhancements (WSE) is a webservice standard which provides cross-platform security for webservices. WSE provides various security specifications like WS-Security, WS-Policy, WS-Trust, WS-Privacy, WS-SecureConversation, WS-Federation, WS-Authorization which can be used to provide authentication, authorization and message level security using digital signing and encryption based on particular requirements on hand. More information on WSE and the areas it addresses can be seen here (This document is a old but provides a an overview of WSE security-model). Another good article on MSDN Building Secure ASP.NET Applications: Authentication, Authorization, and Secure Communication explain different security scenarios and how WSE can be used in each one of them. 1. Download WSE 3.0 from http://www.microsoft.com/downloads/details.aspx?FamilyID=018A09FD-3A74-43C5-8EC1-8D789091255D&displaylang=en and install it on your machine. 2. Create a new ASP.NET Webservice website project. Right Click the project select the “WSE Settings 3.0” option as shown below. 3. This will open the following WSE settings dialog. Select the “Enable this project for WSE” and “Enable Microsoft WSE Soap Protocol Factory” from the settings dialog. 4. Go to the Policy Tab and select “Enable Policy”. Add a new Policy with the name “CustomServicePolicy” (or any name). 5. 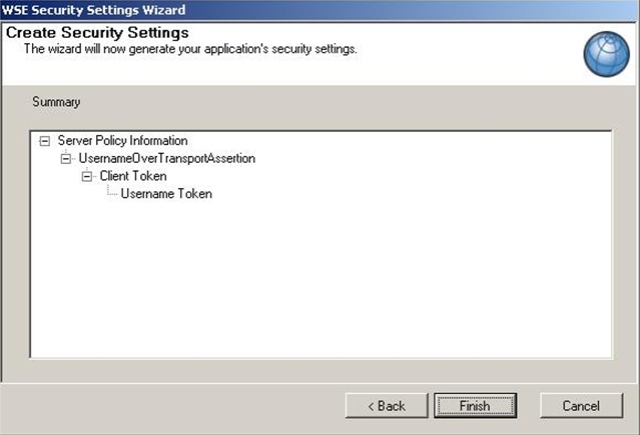 After you add a new Policy, the following Policy settings wizard will open and you will be required to define your policy. 6. Select the Authentication method. 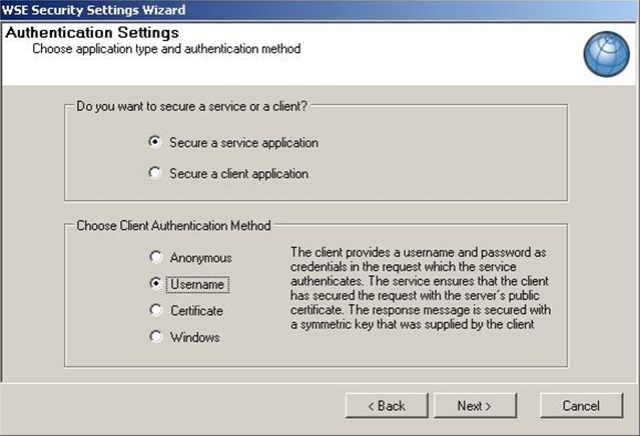 The Authentication method can be Anonymous, Username, Certificate and Windows. In this sample I am going to select the username as we care going to pass username and password for the authentication. You can use other methods like windows if required. Also select that you are seting this policy for a service. (In case you are creating a policy for a client to access WSE webservice you can select the “Secure Client Application” option). Click next to proceed. 7. 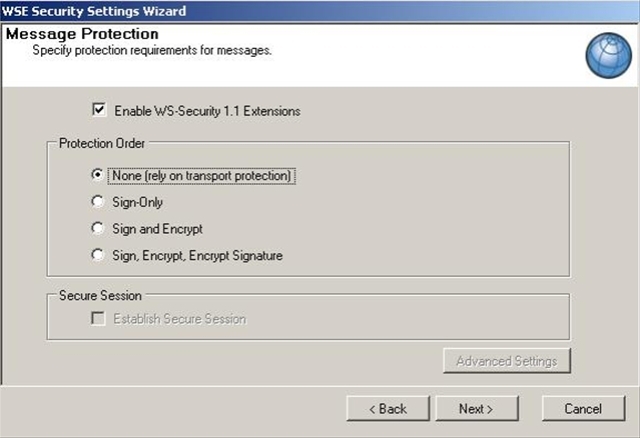 In the following screen you can select “Enable WS-Security 1.1 Extensions” and select Protection Order as “None”. You can select other protection methods if you want to sign and encrypt your messages using a X.25 certificate. 8. Click next to proceed, you will be shown the following screen with the informaiton about the Policy that you have defined. 9. 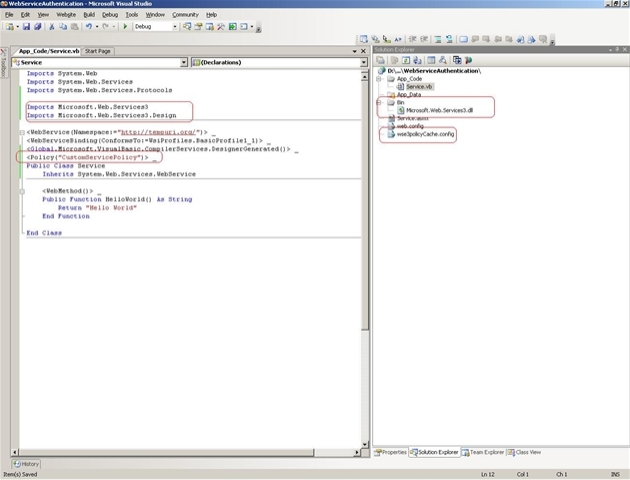 After defining the Policy, go to you service class and add this Policy to the class using the Policy Attribute as shown in the following screenshot. You will be required to add Microsoft.Web.Services3.dll into your project to reference Policy attribute and other WSE classes. The WSE documentation says that this reference will be automatically added to your project if you enable WSE for your project as we did but I have observed that you have to manually add this reference and it is not added automcatically. You can get this dll from the following path C:\Program Files\Microsoft WSE\v3.0\ (The path may be different based on your installation location). Note that after configuring WSE settings, there is an extra configuration file “wse3policyCache.config” which has been added to the project. 10. Now we need to write a Custom Token Manager which will authenticate the username and password sent by the user. Add a new Class “CustomTokenManager” in the project and inherit it from Microsoft.Web.Services3.Security.Tokens.UsernameTokenManager. Override the AuthenticateToken method, WSE soap filter will call this method to obtain the clear text password for the user. 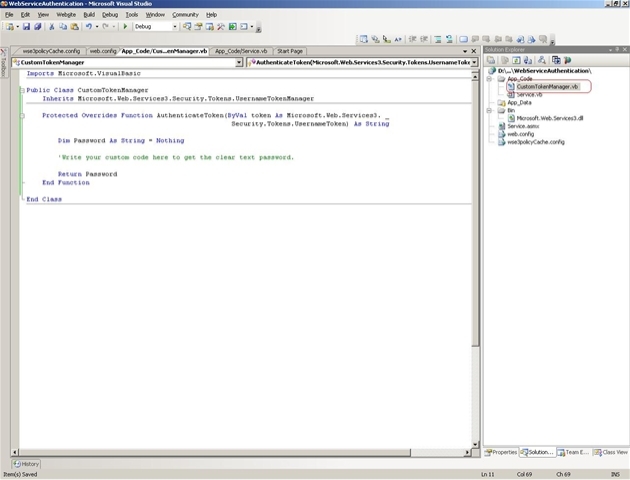 You can write your custom code to access your ASP.NET membership database or other user database to obtain the password. You can get the username from the UsernameToken passed as a parameter to the AuthenticateToken method. 11. After you have you CustomTokenManager ready, you need to set this in web.config in the WSE security settings so WSE can use this class when user authentication is required. Now your service is ready to use and it will authenticate the incoming user with your custom database usign the CustomTokenManager class that you have created. 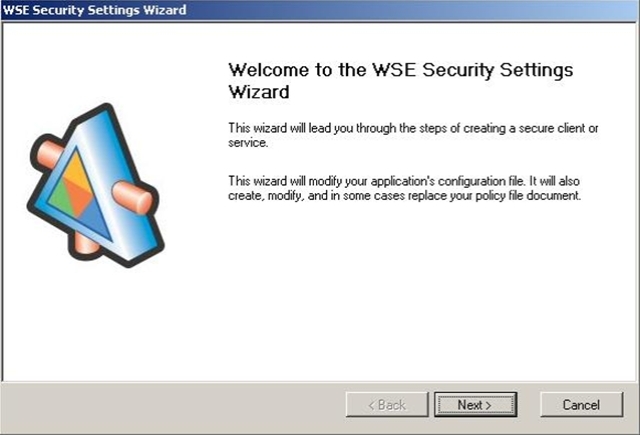 To write a client for a WSE service, you need to have WSE 3.0 installed on the client machine. Moreover, you will have to enable WSE for your project (step 3) before adding the webreference to the server. If WSE is installed on the client machine and is enabled for your project, the WSDL.exe toll will generate an additional proxy class ending with Wse if the service supports WSE. In our case there will be two proxy classes that will be generated on the client. Service and ServiceWse. Use ServiceWse for accessing the service. The following code shows how to pass username and password as UserNameToken in WS-Security header. You indicate that “The custom database can be an ASP.NET Membership database or other custom user database. ” however I am using the aspnetdb to retain the password however it is Hashed. I call the web service using .SendHashed and have a custom Tokenmanager but how do I pull out a clear text password to return from my asp.net membership DB? Any assistance would be greatly appreaciated. This appears to be a problem. However, I can think of two solutions. 1. Change the Password format in your ASP.NET Membership DB to store passwords in clear text. In this case all new user passwords will be saved in clear text but for old users you will have to enforce a change in password. I know both of the above solutions are not perfect but basically SHA1 is a one way algorithm and a hashed value cannot be changed back to clear text. This is pretty helpful article. I am also doing on same. I need to have some more details by discussing with you. Can you please give me any of your contact email id so that I will be able to communicate with you regarding the same. I am really in need for earlier response on the same. 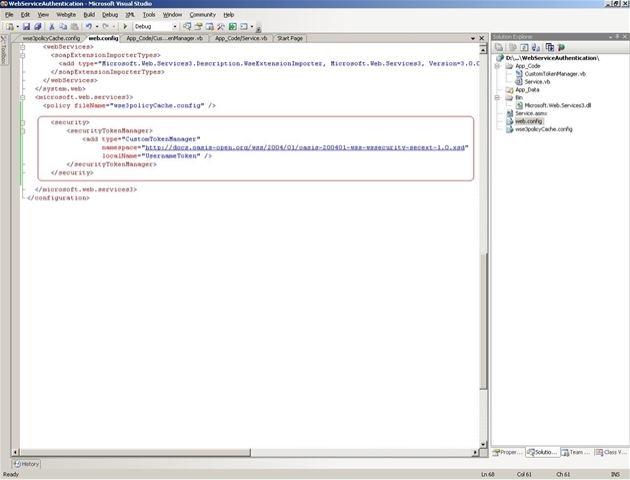 How can we call this WWE enabled service by classic ASP using xmlhttp? Please mail me your response. 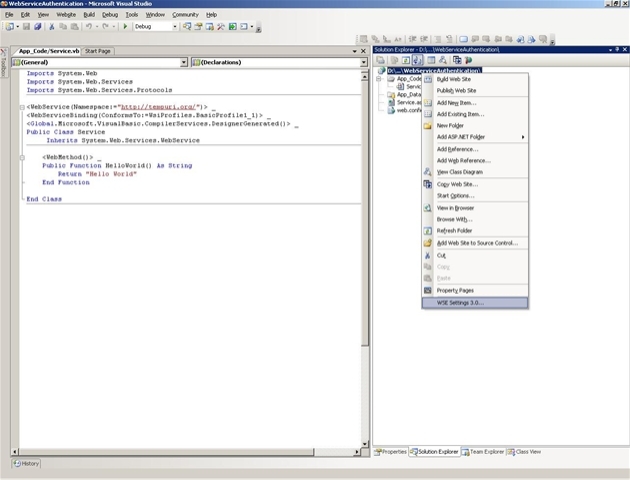 How can we call this WSE enabled service by classic ASP using xmlhttp? I created one WCF Webservice with BasicHttp Binding and SelfSSL. I want to call this services my various clients like vs2003,2005 and java. If I pass plain text password option. My dontnet clients are working. But not java. If I pass Hashed password option iam getting same above error. Aleem you save my day!!! I couldn’t find a simpler example of WSE which REALLY WORKS!!! I tried to do this example. 1. I have a Web Service. 2. I have a Client to call the web Service. I cannot retrieve the “Hello World” in the retStr. Currently I am using VS2008. Hi, I have created a web service with WSE 3.0 using USERNAMETOKEN for the client authentication, and choosing SIGN AND ENCRYPT in the message protection wizard page. Looking the conseguent SOAP message, I don’t understant what algorithms and keys are used, and the order they are applied. 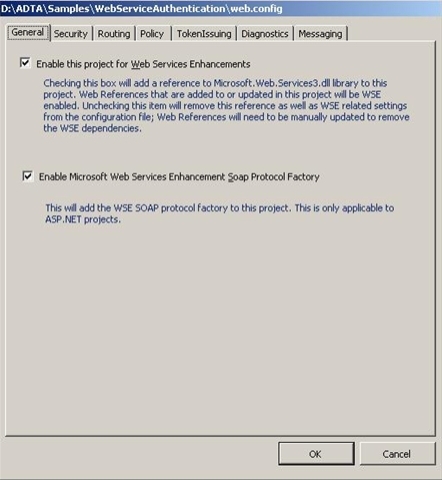 “Enable Microsoft Web Service Enhancement Soap Protocal Factory” is grayed out for me in my asp.net project. It is only available when i setup a new website. How do i use it in my asp.net web project? Thank You for Your article. I have one problem. I implemented Username Token as You suggested on Web Service and windows form windows form client. When I invoke Web Method by client seems to work fine : I can attache to method AuthenticateToken, It ask for password and username,,,, but when I invoked this Web service by browser it returnt me value without asking for password,,,shoudn’t be some null exception? if yes, what I did wrong? I have created a WSE3.0 enabled webservice with UserNameToken & Policies. Can’t I access the service without WSE3.0 in my client? I read your excelent post, I have a problem when I invoke a Web service secure developed with java using as a client vb.net. Do you have an example for consume a java secure web service with vb.net or C#? this code works just for a web service with user and password security. but when the web service has a Sign an verify signature option and Encrypt and decrypt doesn’t works. for Internet also now works with Linux and Chromebook for instant text messaging communication (no voice and video yet, these require a connect-in installment).